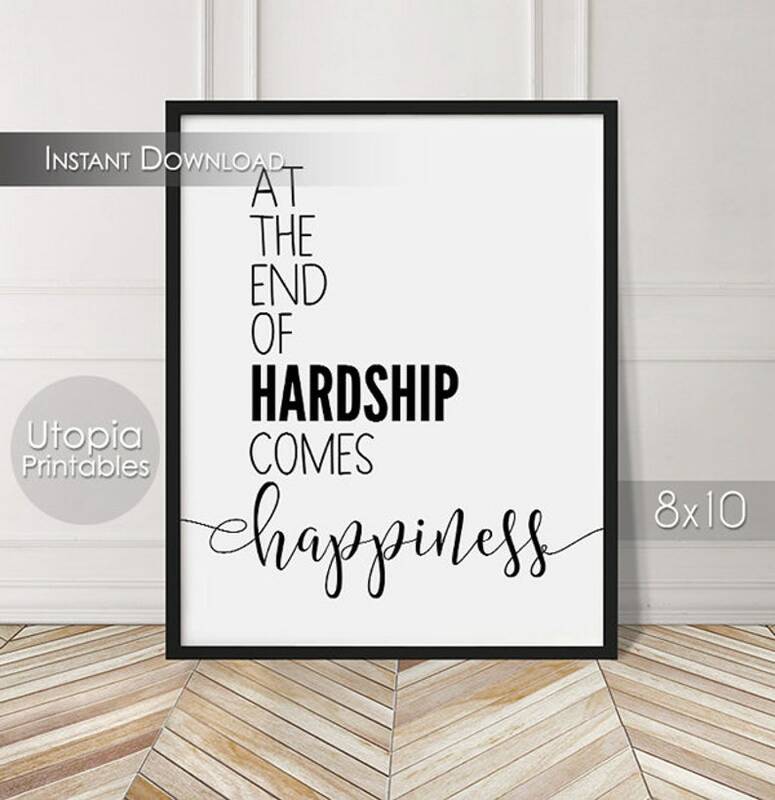 Motivational printable quote that says "At The End Of Hardship Comes Happiness." This is a digital file only. No physical product will be shipped to you. This is not an editable file. Customization is not included with this listing. If you would like this file in a different size or color, please contact me BEFORE BUYING to see if your request can be accommodated. Additional charges may apply. Files are 300dpi to ensure best printing quality. Files include an additional .125in. bleed area to ensure edge-to-edge printing. This file is for your personal, non-commercial use only. It may not be resold or shared. You may print this file as many times as you wish either at home or with the professional printing service of your choice. Buyers in Alabama will be charged 8% sales tax. COUPONS: Discounts from coupons will be applied to eligible orders at the time of purchase when you enter the code during checkout. If you complete an eligible purchase without entering the applicable coupon code, you will not receive a discount. All sales are final. Refunds and exchanges are not permitted for digital files. However, I stand by my products. If you're unhappy with your purchase, please contact me. I'll do my best to make things right. *PLEASE NOTE:* There is a bug on Etsy that sometimes automatically inserts incorrect Returns and Exchanges information into our shop polices. If you see text here or on a Utopia Printables listing stating that returns and exchanges ARE accepted, please note that this text is NOT correct and that refunds and exchanges are NOT permitted for digital files. If there is any confusion, please don't hesitate to contact me. I sincerely apologize for any issues that may arise from this bug. By purchasing items from Utopia Printables, you agree to be bound by the following terms. Please do not request customizations which violate third party rights, copyrights or trademarks (i.e. movie or cartoon characters, song titles/lyrics, movie quotes, sports teams/team colors, etc.) Also, please do not link to or send images of invitations or other products from other shops and ask for a product with a similar look. These requests will be denied. Proofs and finished orders will be delivered directly to you, the buyer. Utopia Printables will not agree to deliver or forward any products or services to any third party outside the original transaction. For example, if you are purchasing an invitation for a friend, Utopia Printables will send the file (and any associated proofs) to you only. You will be responsible for delivering or forwarding the file to your friend. Once a custom or made-to-order file has been finalized and uploaded for delivery to you (via either download link or email), your order is considered closed. You may request further edits to a finished file by purchasing a special listing. Please contact me for this option. Restrictions apply and will be outlined prior to purchase. Communications will only be conducted electronically via Etsy Conversation or email and not by phone. All products purchased from Utopia Printables (with the exception of Scrapbook Paper - see details below) are for your personal, non-commercial use only. They may not be used in any product or service you plan to sell. You may print as many copies as you need either on your home printer or via the professional printing service of your choice. All invitations in this shop measure 5x7 inches. Depending on the design, most (not all) invitations can be resized (for example from 5x7 to 4x6) for an additional fee. Please contact me before buying if you need your invitation resized. Colors can be changed on most invitations. Color changes may or may not incur an additional charge, depending on the invitation design and your color request. Please contact me for details before purchasing if you would like to have the colors changed. If you would like the event changed for an invitation (for example, changing a birthday invitation into a baby shower invitation), please contact me to see if your changes are possible. There may or may not be an extra charge, depending on the design. For most custom invitations, you may request changes to certain elements of a design (backgrounds, text arrangements, etc.) These changes may or may not incur an additional fee depending on how much work may be required to implement your changes. Please contact me before ordering to see if your desired modifications are possible. Uncustomized/blank invitation templates are not available for sale. Vector versions of files are not available. No reselling or redistribution of the files. This includes sharing them online or offering them as freebies or downloads. No selling the images or any product created with the images through print-on-demand sites such as Zazzle, Cafepress, Shutterfly, Spoonflower, etc. No mass production of the images or any products created with the images. No using the files or printed images in any physical or digital scrapbooking kits or clipart/stock image packages. No selling or distributing the image or any part of the image in vector form. No using the images in website templates or wallpapers. Uncustomized/blank templates are not available for sale. Scrapbook papers purchased from Utopia Printables are available for personal use and for commercial use (with some restrictions: see below). You may use scrapbook paper in products you plan to sell, as long as the paper has been modified as part of your own new creation and NOT used as-is. - imagery for Scrabble tile necklaces, bottlecap necklaces, etc. No extended license is required for commercial use. Credit is appreciated but not required. Utopia Printables will not accept customization requests that are political in nature. This includes but is not limited to election-related content, political slogans or content that references any government official, political candidate, political party, or any governmental or political entity, movement or organization. I try to be as descriptive and accurate as possible with the descriptions, but if you're unclear about any aspect of an item please let me know. I'll be happy to answer any questions you may have. Computer monitors and printer settings vary; there may be slight differences between colors in the listing, the file and the printed image, so please take this into account. Technical support for hardware, software or printing issues is not available from this shop. Some artwork used in some designs © Graphics Factory and is used with permission.